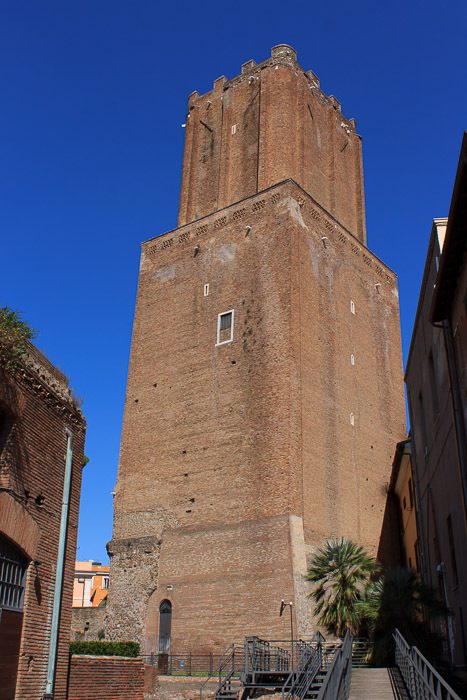 Torre de Milizie, the "military tower" was built in 1200 AD at the top of Trajan's Market as a defensive element. The base measures 35 by 31 feet. 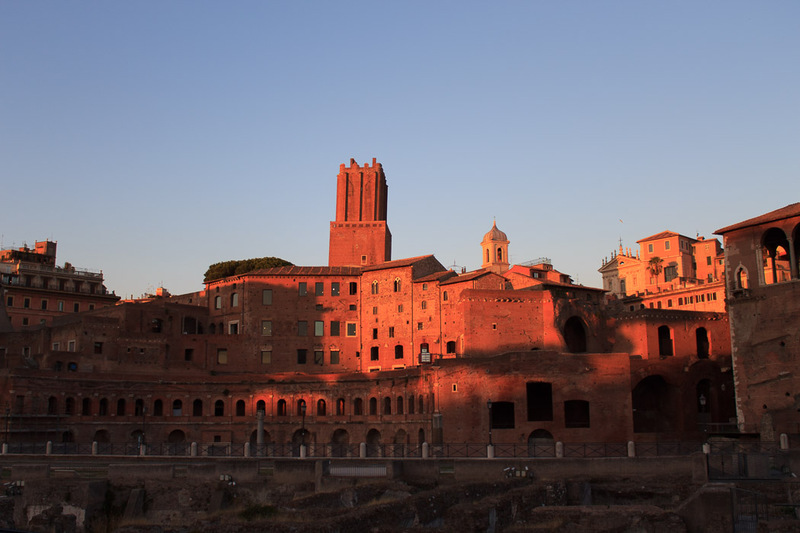 It has a nickname as "Nero's tower" as if it was the tower that Nero fiddled from while watching Rome burn, but this is impossible since it wasn't built until 1136 years after the fire (also, Nero was out of town at the time of the fire, and he didn't play the fiddle). 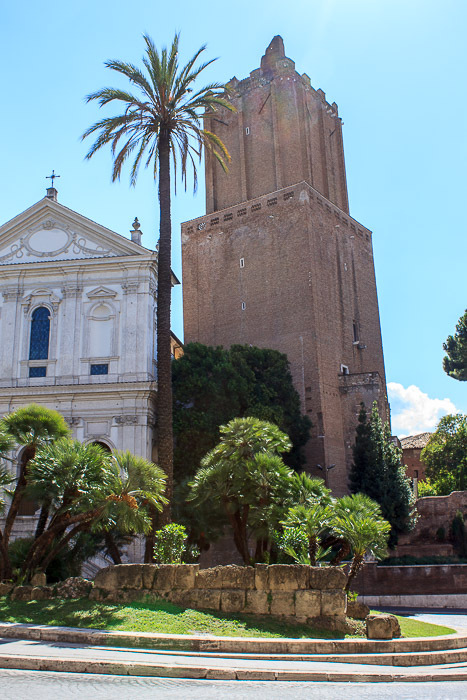 It is one of the main medieval monuments in Rome, and only one of hundreds of towers that crowded Rome's skyline during the Middle Ages. All important families owned a tower; the thicker and taller the tower, the more important the family. Most of the towers were demolished during the 13th century by a decree that attempted to stop the centuries-long clash between Rome's noble families that backed the Byzantine Emperor and those that backed the Pontiff. This tower was one of about 30 that survived that decree, and it passed hands several times during the Middle Ages. It ended up in the hands of the Conti from 1332 to 1619. During that time, the earthquake of 1348 damaged the tower such that the top two floors were demolished leaving the tower at its current height of 160 feet, and the tower acquired it's slight tilt. In 1619 the tower was acquired by a convent which was later demolished. In 1911, the tower was declared an Italian National Monument. 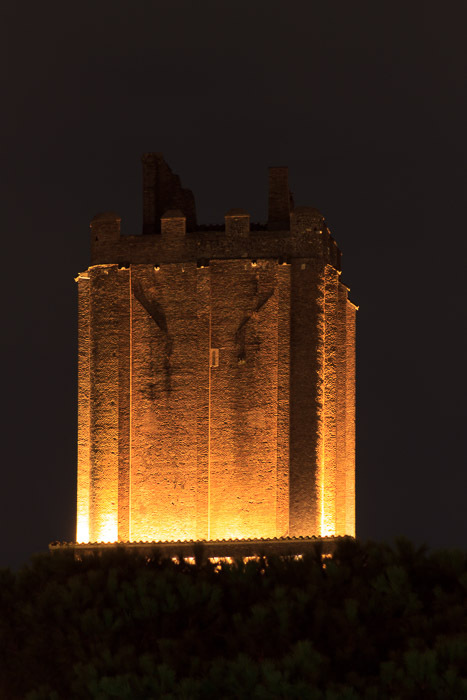 You can get a pretty good view of the tower from the street, near Largo Magnanapoli (3rd photo below). You can get an even better view if you pay to go through the Museum of Imperial Fora, where an outdoor walkway takes you right up to the base of the tower (2nd photo below). The view of the tower from Via dei Fori Imperiali, on top of Trajan's Market is shown in the 1st photo below, and its lighting at night is shown in the 4th photo below. See all Torre de Milizie photos.